Texts of various kinds may need deciphering; examples include codes and other secret writings (see Cryptographer), as well as unfamiliar, badly scribbled, faded, or other difficult writings. I have deciphered all of these, including occasionally difficult portions of a newly discovered five-page manuscript of nineteenth-century orator Robert G. Ingersoll, rendered in his hasty penmanship. I have even written an illustrated treatise on the subject: "Decipherment," chapter 14 of my Pen, Ink, and Evidence: A Study of Writing and Writing Materials for the Penman, Collector, and Document Detective (1990, 169-178). 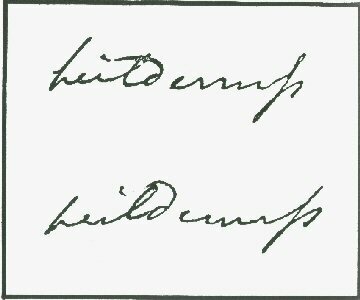 Therein, I advance a technique for demonstrating an interpretation of handwriting to others when the same word or phrase cannot be found elsewhere in the text for one-on-one comparison: using composite letters from elsewhere in the same text, pasted up from a photocopy or assembled by use of a computer. Here is shown from that book figure 14.7 (p. 174) in which the target word at the top is convincingly replicated by this technique—the word being "wilderness" (its final s preceded by an archaic long s).